Mathrafal was an original capital of the Princes of Powys, ranking alongside Aberffraw and Dinefrw as one of the three royal seats of Wales. The fort on the hill 1km NW was perhaps the original seat and the ramparts and ditches enclosing a square of about 100m upon flat ground beside the west bank of the Banwy may be of the 10th or 11th century. 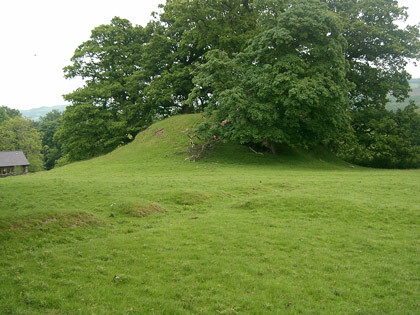 The motte in the east corner and the small bailey in front of it were built either by Owain Cyfeiliog c1170 or Robert de Vieuxpont on behalf of King John in 1212, after Gwenwynwyn, son of Owain, had transferred his chief seat to Welshpool. The castle was destroyed the same year by Llywelyn Fawr. Parts of the retaining Wall have been noted on the side of the bailey adjoining the river.